Does Reggie Bush even care? > News > Does Reggie Bush even care? 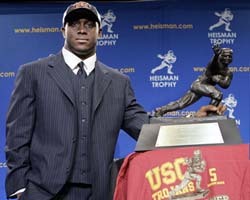 So Reggie Bush’ Heisman trophy has been removed and USC has to send it back. Well big freaking deal for Reggie Bush who is now a very successful running back in the NFL with a new pretty Super Bowl ring he won with the Saints this past season. USC is the one being punished because of this and will likely lose untold millions, especially over the next 2 years as they will not be allowed to participate in any Bowl games. If I recall Reggie is the one that accepted the forbidden money, not USC. Furthermore former USC coach Pete Carroll denies any of this being the reason in him leaving the Trojans to take the NFL head coaching spot in Seattle. Hmmm. Is this fair, is taking Reggie’ Heisman away enough punishment and should USC be the ones taking the hit?